Up there in Elton John/Bernie Taupin's top five albums (along with "Eton John", "Honky Cat", "Goodby Yellow Brick Road" and "Captain Fantastic", in my opinion.). This was an album that did not feature the excellent Elton John Band (some of the appear sporadically), but the hired session musicians were of an exceptional quality. The whole album is played immaculately and the sound on the "Deluxe Edition" is simply superb - full, powerful and punchy along with having a melodic subtlety when necessary. The album is notable for not having any commercial, hit single on it, which was unusual for those days. 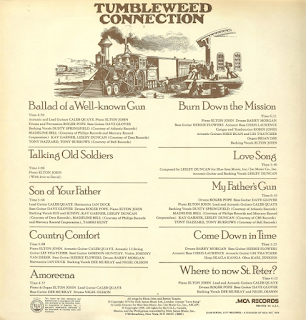 It was a genuine adult, "serious" album, largely exploring Bernie Taupin's fascination with the Old West of the USA in an often sad, sensitive and nostalgic manner (for an era he did not live in). For a lyricist still so young. the songs are remarkably mature and perceptive. It is very much influenced by The Band's first three albums, lyrically and musically. 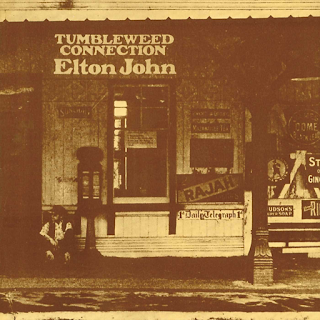 The album opens with the upbeat blues rock of "Ballad Of A Well-Known Gun", full of potent drums and Elton on great form on the piano and vocally. It is another in a long line of Leon Russell-influenced numbers. It features some impressive lead guitar from Caleb Quaye, used by Elton John a lot in the early years. 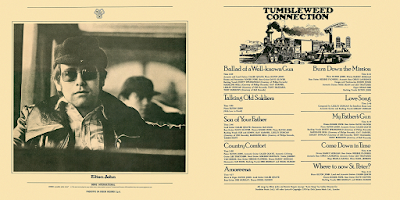 "Come Down In Time" is a beautiful sparsely-backed ballad and "Country Comfort" is a country-influenced rock song, with a great bass sound from resected session man Herbie Flowers and Luddite-influenced lyrics concerning the mechanisation of farms. It was originally written for Rod Stewart's "Gasoline Alley" album, on which he impressively covered it. "Son Of Your Father" has some funky wah-wah style guitar and some blues harmonica and that Elton mid-Atlantic vocal styling. It is a country rock blues song, powerfully played. 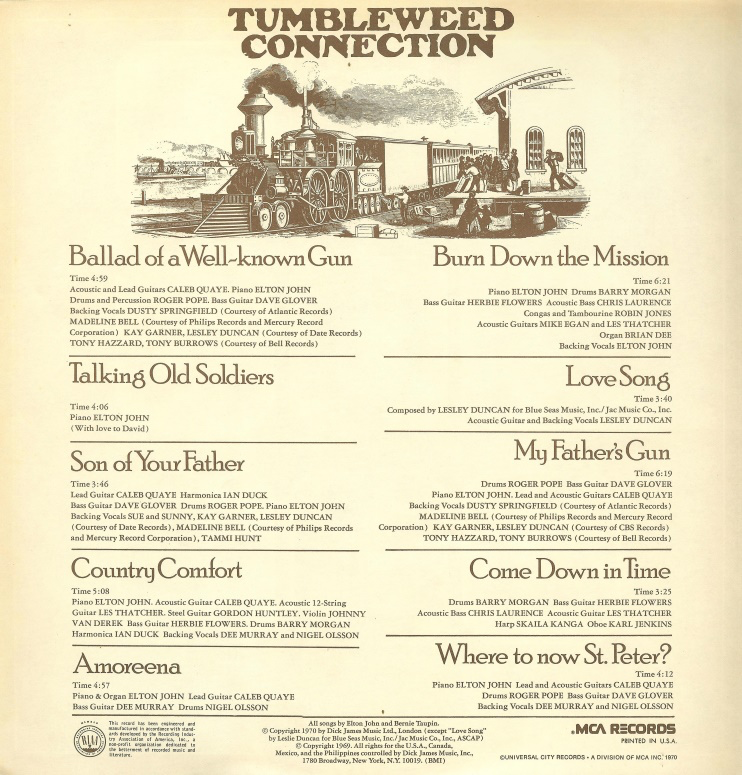 "My Father's Gun" is a slow, mournful and sad song featuring a character lamenting the loss of his father in the US Civil War. "Where To Now St. Peter" is a mysterious song, very folky and beguiling, lyrically, but with a strong rock "chorus" part. More wah-wah on this track too. The beautiful "Love Song" is only song not written by John/Taupin, being written by singer-songwriter Lesley Duncan and sensitively sung here by Elton against a pleasing acoustic guitar backing. "Amoreena" features Dee Murray and Nigel Olsson from the future Elton John Band, and is a strong rock song with powerful backing vocals too. 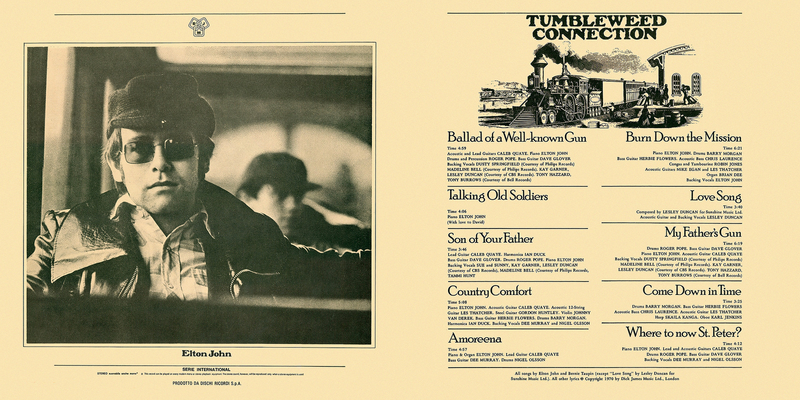 "Talking Old Soldiers" is a sombre, bleak ballad nicely performed but a tiny bit dull in comparison with the rest of the album. Slightly harsh, as it still a good song. Apparently, the composer of Meat Loaf's "Bat Out Of Hell", Jim Steinman, credits the monumental, dramatic "Burn Down The Mission" as being a huge influence on the over-the-top instrumental parts of "Bat". 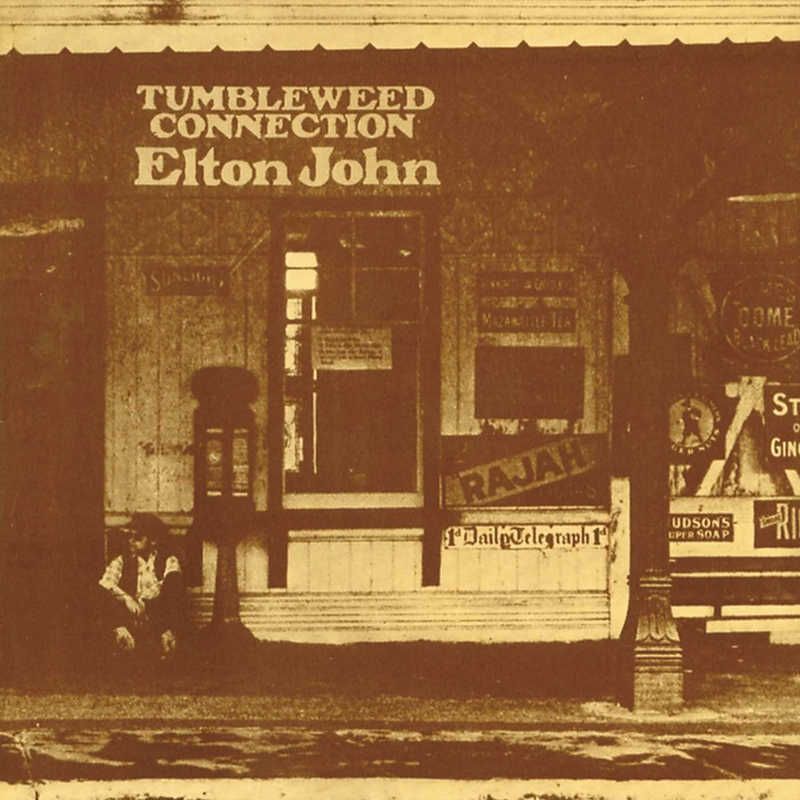 It is certainly Elton's musical tour de force on this album. Again, considering the age of its two composers, in their early twenties, it is a remarkable achievement. Full of lyrical imagery and a huge instrumental build-up and chorus delivery. It was this progression to the high points of the song that Steinman liked, plus the piano-driven instrumental bit five minutes in. Best track on the album.